New York-based advocacy group TransitCenter released the findings of a study on Thursday that identifies the 50 subway stations that should be included under the Metropolitan Transportation Authority’s Fast Forward plan in order to create the most outsized positive effect for riders with impaired mobility. TransitCenter’s plan would serve to connect riders with impaired mobility with major cultural and civic hubs like universities and parks, as well as business districts. 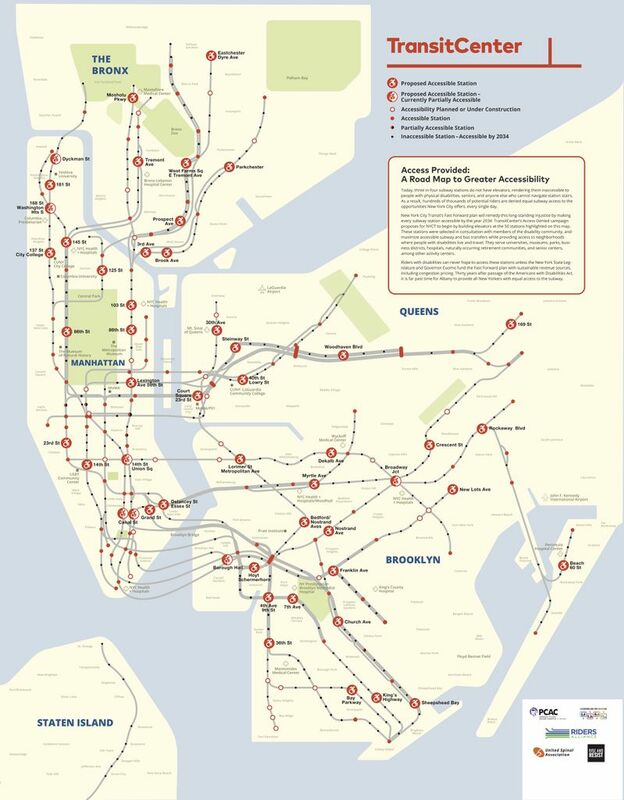 “All told this map would more than triple the potential station-to-station trips riders who rely on elevators can make using accessible stations,” TransitCenter said in a statement. The Fast Forward plan, along with fast-tracking repairs of the system’s failing signals, puts emphasis on installing 50 new elevators with step-free access throughout the system over the next five years. 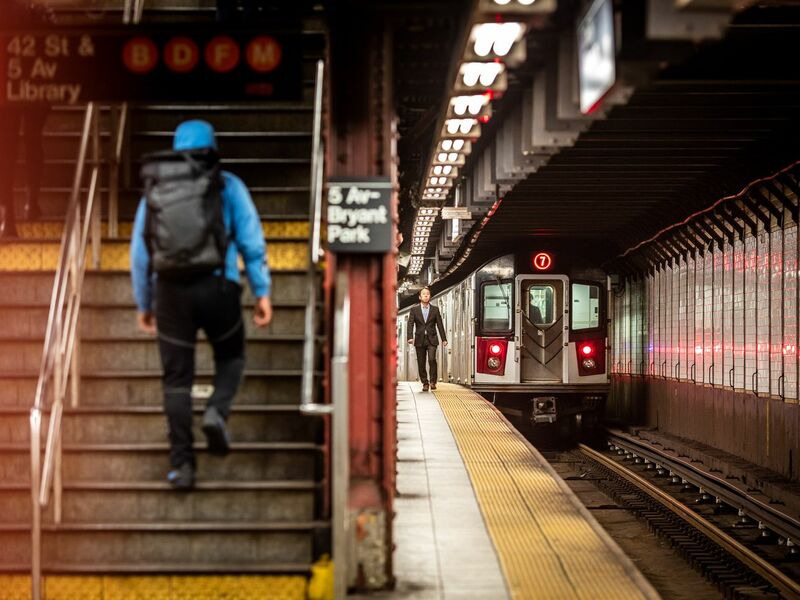 The TransitCenter conducted its study along with the United Spinal Association, Riders Alliance, Rise and Resist Elevator Action Group, and the Permanent Citizens Advisory Committee of the MTA. The plan has also garnered the public support of City Council members Corey Johnson, Ydanis Rodriguez, Keith Powers, Helen Rosenthal and Assembly members Harvey Epstein and Linda Rosenthal, who appeared at the TransitCenter event on Thursday. The map identifies the 50 stations TransitCenter has identified as critical to receive accessibility upgrades under Fast Forward. The stations identified in the map include Lorimer Street-Metropolitan Avenue, Court Square-23rd Street, Lexington Avenue-59th Street and the partially accessible stations at Borough Hall and 14th Street-Union Square. TransitCenter released a map, at right, that outlines all 50 stations. The falling death of 22-year-old Malaysia Goodson at the Seventh Avenue B/D/E station this week has galvanized public transit advocates, parents, and caretakers in a renewed call for increased accessibility across the city’s subway system. Just 118 of the city’s 472 subway stops feature elevators. A 2017 survey by NYU’s Rudin Center for Transportation Policy and Management found that those elevators break down an average of 53 times per year. That’s about once a week that the lifts crucial to providing access to the subway for people with impaired mobility, the elderly, and parents hauling children and strollers are without access to the already paltry number of stations with elevators.